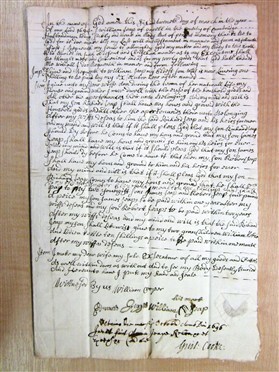 Here is a Will which does not need transcribing! It is not at all difficult to read. There are many details revealed of William's family, so the Will is going to be of great assistance to family historians. William junior is described as "my eldest son now living," so it looks like there was at least one son older than William who died first. Then there are the other family members specifically mentioned: his Wife Ann; Richard; James; Robert; and his grandchildren William Kettle and Lidiea Kettle. 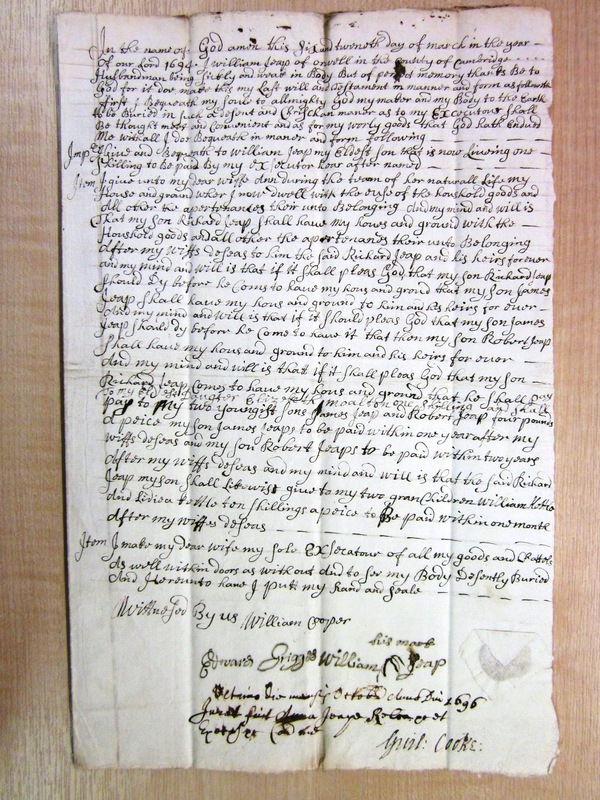 William only gave his Wife a life interest in the house and contents, so he could be certain that they ended up in the hands of his second eldest son (not poor William, who was cut off with a shilling) provided he survived as stipulated in the Will. 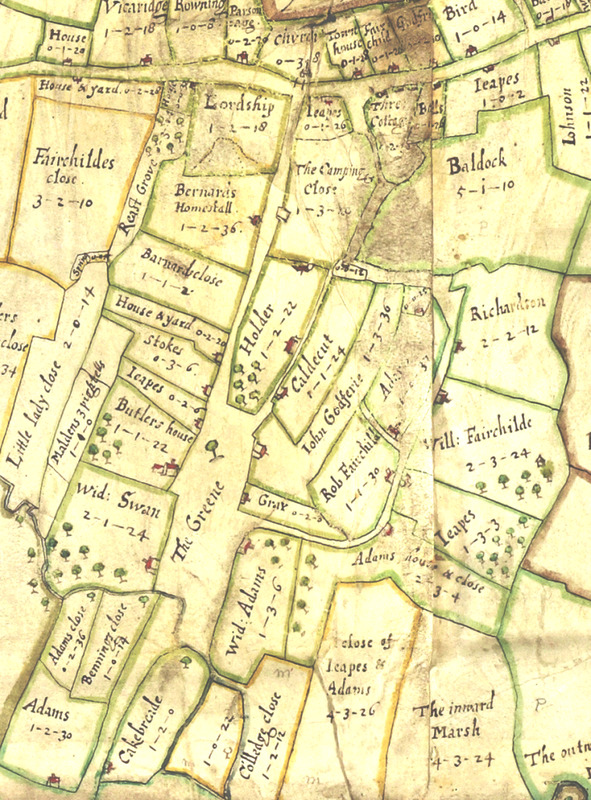 The 1686 map. Note several Jeapes properties. 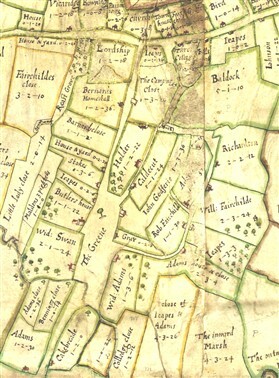 The map of Orwell prepared in about 1686 for the Chicheley family of Wimpole Hall shows that there were several houses in Orwell owned or occupied by the Jeapes family, so it is not possible to say where this testator actually lived. It could be that William junior lived in one of these houses, and if he was well enough off in his own right, then it may explain why William senior did not feel the need to give him anything more, except for a token shilling to show that he was not entirely overlooked. Otherwise, it could be a mark of disapproval, and one wonders what had gone wrong between the two Williams! There is no clue as to who actually wrote the Will. It is not in a legal hand, and it does not use much legal language, but it is clearly written by someone who was familiar with such matters. His spelling is somewhat phonetic in places - 'chrischan manor,' and 'my wiffs deseas' are examples, so that it is unlikely to have been the local vicar, who could be expected to have made a better job of it.